My bank card recently expired. I got a new one and this one turned out to be "lucky": its CVC code was 000. For a few months I used it extensively, both online and offline, without any difficulties - until the day when I entered my card details on Booking.com. I filled in the form, clicked "submit" - only to see the page discard the value in the CVC field and demand that I enter it again. I contacted support. 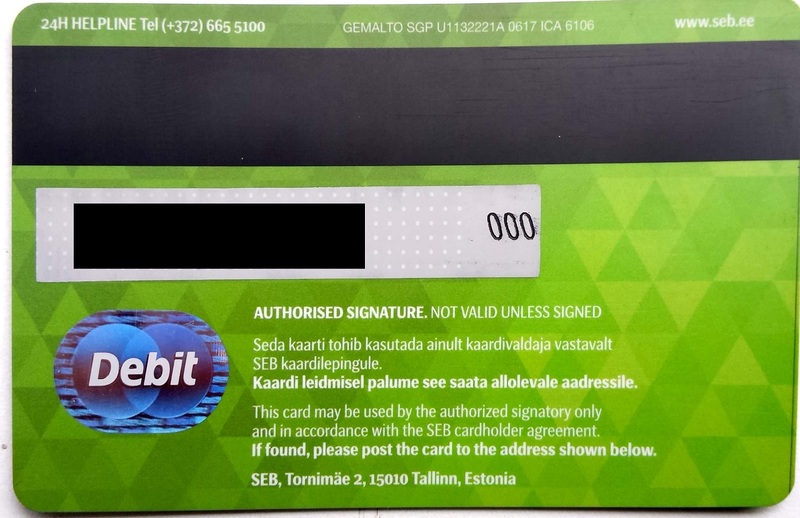 They confirmed that CVC code "000" is not acceptable because it is considered not secure enough (not an exact quote unfortunately, as the conversation was in Estonian), and they suggested that I order a new bank card where the CVC code would be different from "000". CVC is not just a random number, there is a certain algorithm of generating it. This, in turn, means that all values are equally probable and some certain numbers can't just be excluded from it. I have already used this card with a number of other online services, including Amazon Web Services, whose security is out of any doubts. I don't quite understand what "not secure enough" means. Are "111" or "999" secure enough? If not, how about "123" or "234"? Again, it's not something I pick myself, it's something I'm given by a bank, and if the bank thinks it's secure, then it must be treated as such. Their response was very polite but not very helpful: "We totally understand your frustration and we are really sorry about causing you inconvenience. We handed your reasoning over to our management - they responded that 000 is considered invalid, and this is also a way banks indicate that the card is a forgery". I forwarded the mail chain to my bank and asked for their advice. They told me they'd issue a new card for free, which solved the problem for me. Are there any official regulations/prescriptions (from Visa/MC or elsewhere) or any best practices regarding "all-zero" CVC/CVV codes? Especially that bit about banks allegedly using 000 as an indication of a forgery - sounds like complete nonsense to me. I tried googling, but couldn't find anything. From a practical point of view, how reasonable it is to decline "000" as insecure? I listed my concerns above, but maybe I'm missing something? Update: Tough choice on which answer to accept... I liked the answer from Alexander O'Mara a lot - it is detailed and to the point. The latest revision of Harper's answer also seems very reasonable. Yet I eventually decided to accept the answer by Zoey - it seems the most relevant, as it, besides everything else, also sheds some light on the internals of hotel business. Thanks everyone for your answers and comments! What I'm going to do now is contact Booking.com support again and insist on getting this fixed. Will let you know about the outcome. Update 2: After several months of trying to contact Booking.com's support I officially give up. I haven't gone any further than a countless number of support tickets that were not even confirmed, not to mention being reacted on, and a couple of phone calls where I explained the situation and got nothing but a canned email "we are trying very hard to solve your problem". Bottomline: Booking.com's support doesn't work - unless your problem is very standard, it won't be solved nor escalated to higher management. Create a new booking that requires immediate payment. Enter an invalid card (expired or blocked). When the system sends a notification that the card can't be processed, select "update card details" and enter details of a valid card with CVC code 000. Expected result: the card data gets accepted for further processing. Actual result: the entered CVC code gets discarded and the dialog window complains that CVC code is not entered. Alexander O'Mara provided a correct answer, but having worked in a hotel that was using booking.com I believe I can provide additional information about the reason that CVV was denied. Every day the hotel I worked in would receive around 50 bookings, a quarter of these bookings would be using fake credit card details, and about 90% of people using fake credit card details would not show up. This resulted in a lot of guesswork when assigning rooms, we would often try to guess if the person will show up just based on their credit card details, and also sometimes take into consideration the name, location, how many days they will be staying, etc. We would also try to call the day before to confirm bookings, so that these fake bookings result in a minimal interruption to the business. Blocking CVV 000 is just booking.com's lazy attempt to reduce the amount of fake bookings. Some other CVVs are blocked as well. The reason why booking.com blocks the CVV and other websites do not is because other websites generally attempt to charge the credit card immediately, while booking.com only forwards information to the hotels which charge the credit card on the day of arrival. The only weak argument I can think of to reject such a CVV would be that if someone were trying to brute-force your 3-digit code, they might start with 000 first (but would they also reject 001?). From practical point of view, how reasonable it is to decline "000" as insecure? It's not really reasonable. Either you can charge the card with the provided CVC/CVV code or you can't. There's no good reason to reject this code, since it is valid, and you can't really be sure if a credit card's codes are valid until you actually try to charge it. Sadly, poorly-designed input validation is all too common. Some developers have a tendency to just assume certain values are invalid without checking the spec, or not properly unit test their input validations. It's also not uncommon that people in customer service will respond to your bug reports with something along the lines of "that's not a bug, it's a feature" without ever even consulting the developers. This is a frame challenge of the company's claims. A random number in the range 000-999 is more secure than 001-998, rejecting values weakens it. It's a software bug. They can't admit it. if ($CVC) # is CVC field present? In an untyped language, a blank string evaluates to 0 (false) as the programmer intended, but so does 000! There are better ways to do that. In this case, we know the problem is not in the public-facing web UI you use, but in the back-end platform that both of you share. The agent should open a bug on it in the ticketing system. So why did they claim what they said? Because normal businesses are very reluctant to admit this kind of structural error that makes them look incompetent. But they also cannot send you off with an "I don't know", as that has the same effect. So they need to say something to you right now that feels sellable to them. Obviously it is wrong; as proven by all the other people you do business with who have no problem with it. But try it yourself; try a competing booking platform and see how it goes. So far it has never been denied, but from a security point of view I don't like it as I feel like it could very well be the first thing a thief would type in if somehow they had my numbers but not my card. My guess is that this is actually a rather reasonable attempt to mitigate data processing errors that happen further down the chain, and in systems that are out of booking.com's control. As a card-processing merchant, they are obliged to process valid cards, so are probably breaking merchant rules here and could get in trouble with VISA (or whoever)... but i can almost see the logic. I have some problems with the simple "stupid bug" theory here. I have no doubt that the person you were talking to was pulling this nonsense out of thin air (as some customer services people are wont to do). 000 is perfectly valid and you're no the first person on the internet to point out having the number. But there's a scale here that people aren't appreciating. Booking.com is a business that generated $8 billion in raw 2017 revenue, most on card transactions. That's about a fifty thousand medium bookings a day. Booking.com must therefore encounter 000 50 times a day. To a tune of $25k lost to Booking.com and, much, much more in terms of actual bookings not passed on. Rejecting 0.1% of card transactions is $9m in lost revenue. In the [very much smaller] businesses I work for, booking flow analytics would flag this up the chain pretty quickly. These sorts of companies (I tangentially work in holiday booking systems), the cart experience is the most tracked part... I'm finding it very hard to believe that a company that relies on analytics would miss something as simple as a card validation issue. This is a local bug. Many multinationals put money through local accounts and bounce it around from there for tax purposes. It may be that Booking.com allows its local offices to edit the code on this to handle local quirks (currency, whole payment schemes that aren't global) and in doing so, allowing bugs to creep in that don't exist elsewhere. The possibility of this is increased because the target country is Croatia. They use the Kuna there, not the Euro. There may well be a raft of accounting differences and mechanism providers. That also goes some distance to explain why this has gone under the radar. 0.1% of Croatia-bound money is going to be a hell of a lot less than the global income. As JPhi1618 points out in the comments, the other scope-limiting factor is that perhaps banks don't issue 000 very often. There's no reason they shouldn't and as I've said, there is evidence online of other people with 000 cards, but that is not to say it is common. I have no way to verify this. Perhaps somebody with a card processing log that includes CVVs can run an analysis. Still, if you find issues like this, report them. Skip the customer services team because they simply don't know what's going on. Go to the CEO, or security team as they're both going to take this pretty seriously for slightly different reasons. $9m in lost revenue is a good motivator. Note that on some Credit Card software, a CVC with the magic value 000 means that a CVC was provided but has been deleted since (due to PCI constraints). That's probably what Booking is doing, and that explains why they don't accept it. Is CVV calculated or merely assigned? How can my bank debit card reader know that my pin is valid? My client needs credit card details emailed to them, will an encrypted file work?